Representatives of the ICAS consortium standing in front of the spool concluding Europe’s contribution the conductor for the manufacturing of the ITER Poloidal Field coils. 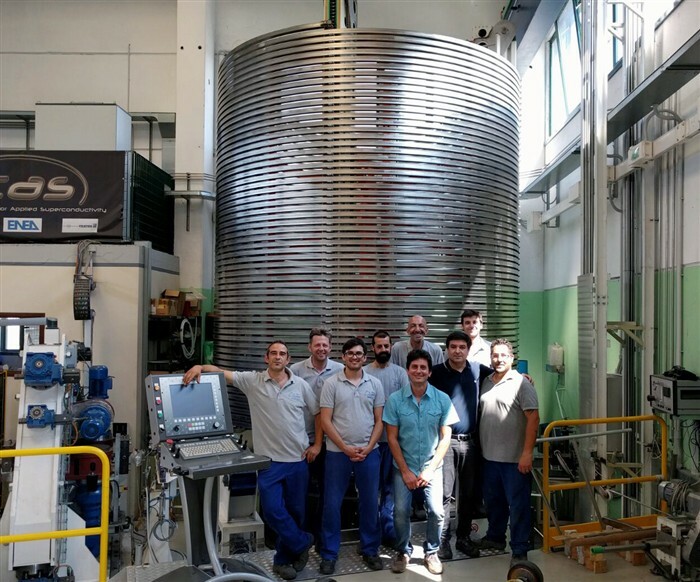 The conductor that Europe is responsible to produce, as part of its contribution to ITER’s massive Poloidal Field (PF) coils, has been successfully manufactured. The milestone was celebrated at the ICAS/Criotec facility (Italy), where the last European conductor length was completed early in July. Next, the conductor will undergo final tests and it will be shipped to the ASIPP facility (China), where one of Europe’s coils is being manufactured. The PF coils are powerful magnets that will control the shape and stability of the ITER plasma. The six magnetic rings will embrace from top to bottom the hot gas which is expected to reach 150 million ˚C. Europe will deliver five of the PF coils and Russia the remaining one. The conductor is made of Niobium-Titanium (NbTi) superconducting strands. In essence, more than 1 400 of superconducting strands are bound together to form a cable, which is then inserted into a stainless steel jacket, tightly compacted and finally, spooled. The PF strand (NbTi) was produced by JSC ChMp (Chepetsk Mechanical Plant) and the cable by JSC VNIIKP (Joint Stock Company All-Russia Research Institute for Cable Industry). The conductor that Europe has manufactured will be used for the sixth PF coil which consists of 18 conductor lengths. Through agreements signed between ITER International Organization, Europe and Russia, it has been decided that F4E would supply 10 of the conductor lengths and the remaining 8 would be delivered by Russia. The production of the 10 conductor lengths, which are in the range of 7 km, marks the end of Europe’s contribution to the conductors for the PF coils, and is another achievement that will accelerate the supply of ITER magnets.